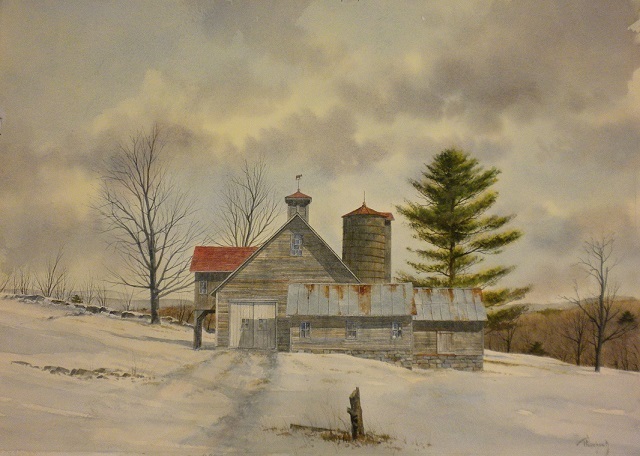 Thomas A. Puschock was a well-respected watercolor artist, born on February 9, 1944 in Nesquehoning, PA. He sold many paintings and lived to experience a high demand for his work in the later stages of his life. Puschock was a painter of realism, painting what he saw in all its honesty. He was most noted for capturing a mood and the weather in his pieces. He used true-to-life colors and rendered with the art of seeing in detailed accuracy. His watercolor paintings were admired by many, as the smells of the season or crispness of the air were visually realized in his work. Puschock’s subjects were scenes of life around him, like photographs in time. In his early childhood, his talents began with drawings of WWII vintage aircraft and steam locomotives of the Jersey Central Railroad. Puschock’s detailed work led to teaching fellow elementary classmates how to draw airplanes, after observing his teacher’s example would not be able to fly. Later on in his life, Puschock served in the Air Force. Puschock and his wife Patricia moved to Maine in 1974. She brought him on a walk to show him Portland, which led them to stumble upon a seasonal gallery run by a retired lighthouse keeper. There he began showing his work and selling many pieces. Puschock also did outdoor shows. As his art started to take off in the early ‘90s, he had to stop both because it was in high demand and its value increased dramatically. He then began selling many pieces through professional galleries. Puschock won over a 100 awards and honors in his lifetime. In August of 1990, Maine’s Governor, John McKernan, presented one of Puschock’s marine paintings to President George H. W. and Barbara Bush. The work is titled “Up for Repairs” and still hangs in their summer home in Kennebunkport. Puschock became great friends with Bill Harrison when he hired him to work alongside him at a former advertising agency in Portland. Early in their art careers, they entered an art competition in East Hartford, and Harrison declared that they would win first and second place. To their surprise, Harrison won the Governor’s Award and Puschock won Best in Show. On that day, Puschock learned to have confidence in himself that stayed with him, giving him that little edge whenever he needed it. He was always grateful to Harrison for that. Puschock exhibited his work in many well-known galleries in New England: Gallery on the Green of Woodstock, VT, Robert Paul Galleries, Stowe, VT, and Maine Art—the Gallery on Chase Hill, Kennebunkport, ME. Puschock’s art earned him much recognition and even after his death, his art and talents are enjoyed and respected by many. A sample of his original works may be viewed In our gallery at Mainely Frames and Gallery, 541 Congress St., Portland, ME.